A child of the community, an athlete, a friend, a young lady with a smile as big as the sky with a heart to match was tragically taken from us before she could experience all that life had to offer. She was full of life and all those who experienced her warm embrace knew that something special had touched their lives. She is our guardian angel in heaven now and looks down on us with the same warm smile and only asks that we wrap our arms around our children and give them the opportunities she had to excel. Please help continue her legacy and extend your love to all of today's children and future generations by giving generously to the foundation's projects and continued mission. 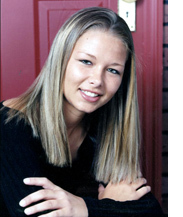 The Give A Smile To A Child Foundation was formed in 2008 to honor Amanda J. Buckley and all that she stood for in her short life Love, Compassion, Sportsmanship and the love of the game. In her memory, the Foundation has endeavored to help children and families who are beset by hardships when unforeseen tragedies occur. The Foundation is a 501 (c) (3) Not for Profit Corporation and is unique in that there are no huge administrative costs that detract from donation dollars. Everyone is a volunteer and dedicates their time to help the Foundation's mission of helping children. The Foundation contributes monies and volunteers to the Holiday Joy Drive, and as of 2011 we have helped more than 3,000 children and families during the holiday season. The Foundation also volunteers and lends financial support to feed the homeless, clothe babies in need, help families pay for funeral expenses, helped elementary school age children with basic classroom supplies and provides scholarship funds to high school graduates in need. The Foundation's mission is to help children and families who have sustained emotional and financial stress due to unforeseen circumstances beyond their control. The Foundation, with support from its many and varied friends and corporations, will continue its giving and protective demeanor with the help of thoughtful contributions and the efforts of its many volunteers to host fundraising events. Granted Tax Exempt Status--Federal and State of Florida. Helped defray funeral expenses for a slain P. B. County athlete. Donated to the Foster and Adoptive Parents Association, who take care of abused, neglected and abandoned children. College scholarships to two deserving high school athletes. Feeding the homeless during the Thanksgiving Holiday. Donated time and funds to the Palm Beach Gardens Police and Fire Department’s Joy Drive, helping over 500 disadvantaged children and families during the holidays. Started and completed Phase I of the “Field of Dreams” Memorial Stadium and training facility at Plant Drive Park, Palm Beach Gardens. This facility is providing children the opportunity improve their mental and physical capabilities in a safe and nurturing environment. Clothing for disadvantaged elementary school children. School supplies for elementary classrooms. Clothing and Diapers to babies in need. College scholarships to three high school athletes. Donated time and funds to the Palm Beach Gardens Police and Fire Department’s Joy Drive, helping more than 630 disadvantaged children and families during the holidays. Started and completed Phase II of the “Field of Dreams” Memorial Stadium and training facility at Plant Drive Park, Palm Beach Gardens. College scholarships to five high school athletes. Donated time and funds to the Palm Beach Gardens Police and Fire Department’s Joy Drive, helping more than 670 disadvantaged children and families during the holidays. Started and completed Phase III of the “Field of Dreams” Memorial Stadium and training facility at Plant Drive Park, Palm Beach Gardens. Awarded 5 scholarships to deserving and need based athletes. Participated in the feeding of the homeless at Thanksgiving through St. Mark’s Church. Completed Phase IV of the “Field of Dreams” Memorial Stadium and training facility. Provided funds to help pay hospital expenses for a tragically injured child. Completed Phase V of the “Field of Dreams” Memorial Stadium and training facility. Provided funds to help defray funeral costs for a family who tragically lost their child. Furnished elementary classroom supplies for in-need children. Provided funds and volunteers in support of the Palm Beach Gardens Police and Fire Department’s Joy Drive. Provided funds to help feed 525 disadvantaged families during the Thanksgiving Holiday. Awarded 5 college scholarships to deserving and need based athletes. Completed Phase VI of the “Field of Dreams” Memorial Stadium and training facility. Started Phase VII of “Field of Dreams” Memorial Stadium, i.e. the Memorial Garden. Provided funds to allow more than 500 families to enjoy a Thanksgiving meal in conjunction with the Big Heart Brigade. Fed the homeless in conjunction with St. Mark’s Church at St. Georgia’s Church in Riviera Beach. Supplied funds and volunteers in support of the Palm Beach Gardens Police and Fire Department’s Joy Drive to reach more than 900 disadvantaged children and families. Provided elementary school children with supplies and clothing. Supplied volunteers, funds and supplies to start the “Practice Reading at Home” program for in-need elementary school children. Provided funds for several youthful patients for cancer and surgical procedures. Completed Phase VII of the “Field of Dreams” Memorial Stadium and training facility. Started Phase VIII of the “Field of Dreams” Memorial Stadium and training facility which included enclosure of the outfield fence, irrigation, and practice infields. Donated funds and volunteers to help families in conjunction with the Fraternal Order of Eagles. Provided elementary school children with classroom supplies and clothing. Volunteered to feed the homeless at St. George’s Church in Riviera Beach. Provided funds and volunteers to help feed 500 disadvantaged families in conjunction with the Big Heart Brigade. Supplied volunteers, funds and supplies to continue our efforts with the “Practice Reading at Home” program for in-need elementary children. Supplied funds and volunteers in support of the Palm Beach Gardens Police and Fire Department’s Joy Drive to reach more than 1,000 disadvantaged children and families. The Foundation will continue to raise funds to promote the welfare of children and families. The quest to find a corporate or personal benefactor to complete the “Field of Dreams” Memorial Stadium and training facility will continue. The Foundation’s volunteers will not rest on their accomplishments during this upcoming year and will work tirelessly to complete the missions of the Foundation. Your comments, suggestions, volunteerism and is always welcome!! The specific and primary purpose for which the Foundation is organized is to provide aid, assistance, facilities, educational opportunities and support to children and families who find themselves in need due to tragedies and other circumstances beyond their control. The Foundation will promote and participate in worthwhile endeavors that enhance the physical and mental well being of children and families. The foundation will provide support and assistance to other foundations and charities benefiting children and families. The Foundation will honor and recognize outstanding children for their achievements. The foundation will solicit fund/donations and perform fundraising activities.